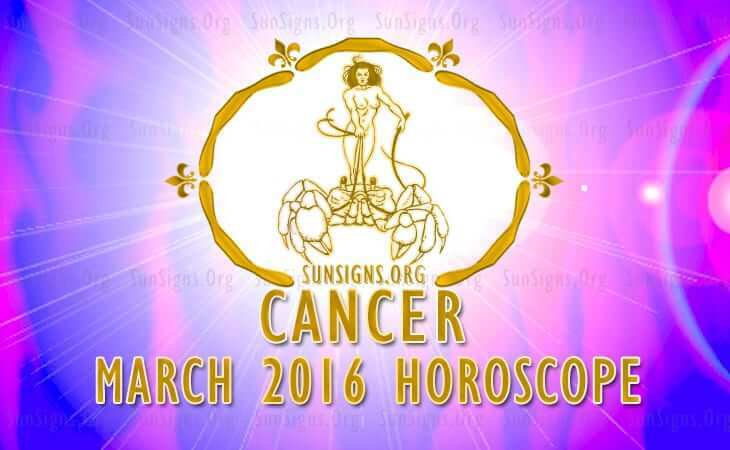 March 2016 Cancer Horoscope forecasts the predominance of career and professional matters. You can keep aside home and spiritual issues for the time being. Professionally you will be reaching your summit by 19th. Relax during the solar eclipse on 29th March. The Lunar Eclipse of 14th March will affect Cancer zodiac students. There will be significant alterations with moving to different institutions or problems with family members and friends. Your personal behavior and appearance will become different. It is essential for the Crabs to collaborate with others to attain their goals. You have to be flexible in your approach and your social connections will help you to overcome challenges. The 2016 astrology predictions foretell that there will be major shifts in the working environment and your organization will face major transformations. There will be rewards both financially as well as status wise. Considerable progress can be expected during the month in your career and more clarity will emerge regarding your career after 20th March 2016. March 2016 will be a wonderful month for the finances of the Crabs. You will be excited by the various opportunities to make money. Superiors and family members will help you in accomplishing your monetary targets. Speculations will be profitable and unexpected windfalls are likely. You can put your money in oil and gas or shipping to make some quick money. The Cancer 2016 March forecasts suggest that love affairs can be expected, but they come with their own problems. Cancer compatibility with your spouse will be strained due to your extra commitment to your career. Existing relationships will be tested and require reassessment. All major decisions regarding love relationships should be postponed as your planetary patterns are inauspicious. Dating a Cancer will be fun but this might not be a month for serious matches. Relations with the family will be peaceful. You should devote your time to maintain harmony between family members. The Cancer predictions for March 2016 foretell that health will be normal till 20th, after which it requires extra attention. Do not indulge in radical changes to your fitness and diet routines. Be sure to give some time for mental relaxation and healing. To conclude, the Cancer horoscope for March 2016 predicts a busy time on the career and business front.